Global Nanocellulose Market size was estimated over USD 87.5 million in 2016 and will exhibit growth of over 33.9% up to 2024. Rising packaging industry along with persistent need for sustainable packaging materials is likely to boost the nanocellulose market size over the projected timeframe. Stringent regulations imposed by regulatory bodies has prohibited non-biodegradable packaging material particularly for food industry, which is likely to drive demand for sustainable light weight packaging material in the coming years. Product possesses excellent properties including light weight, superior strength, rigidity, transparency, etc. which makes it viable for numerous commercial applications across oil & gas, food & beverage, automotive, aerospace and personal care industry. It possesses the potential to replace numerous petrochemical based products and is cost effective compared to other nanoscale high performance materials. Another driving factor for the nanocellulose market is the paperboard and paper production industry. This radical and innovative material performs as a strengthening agent and an additive to generate stronger and denser paper. This is possible due to the greater surface area of the nanoparticles which leads to a smoother and improved quality of printing paper. The product is bio-degradable, light in weight, cost-effective and optical which, in turn, is making it popular in the electronic industry for end-use in paper-based generators, solar cells, touch sensors, TVs, computers, mobile phones, etc. Growing environmental pollution benefits the industry owing to its green technology and eco-friendly nature. According to the Global Greenhouse Gas Emissions study, 18.5% of the environmental pollution is due to industrial processes, whereas 10.5% due to the fossil fuel retrieval, processing & distribution. Increasing environmental concerns for global warming and regulations for environment conservation will fuel the market in the next couple of years. Owing to the products superior properties, these submicroscopic particles offer high strength and great mechanical stiffness as well as are exceptionally lightweight. This increases their costs in the industry, thereby making them costlier than other products and creating a hindrance for industry in the coming years. Based on product, nanocellulose market is segmented into nanofibrillated cellulose, nanocrystalline cellulose, and bacterial nanocellulose. Nanofibrillated cellulose has lately gained attention due to its renewability, economic value, high mechanical properties, low density, and biodegradable-nature. In 2016, the segment accounted for a highest share close to 50% and is said to grow with a CAGR over 35%. Considering revenue in the nanocellulose industry, nanocrystalline cellulose holds the second highest share and surpassed USD 35 million in 2016. Also known as microfibrillated cellulose, the product is attained from natural cellulose fibers that are renewable & biodegradable. Due to this nature, they serve as environmentally friendly and sustainable material for major applications. In terms of volume, bacterial nanocellulose is the smallest segment, and is said to grow at the highest CAGR in the coming years. 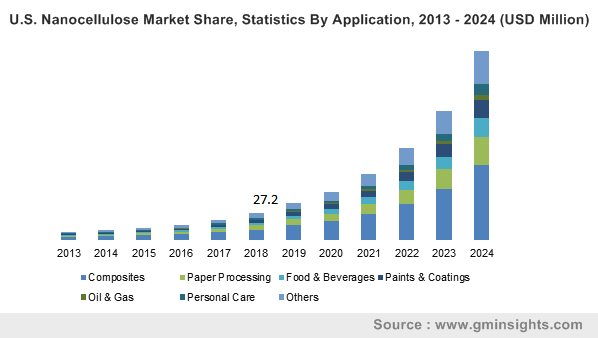 On the basis of application, nanocellulose market is segmented into paper processing, composites, personal care, oil & gas, paints & coatings, food & beverages, and others which includes electronics, etc. in the food & beverage industry Then the product finds application as a non-caloric food thickener. In terms of revenue, the segment registered a share close to USD 7.5 million in 2016 and is said to grow at a lucrative rate from 2017 to 2024. Composites segment held a highest share of over USD 30 million and is said to grow at a CAGR close to 35% from 2017 to 2024. In terms of volume, paper processing segment held a share of over 15% in the global market in 2016. Increase in paper and paperboard packaging activities is will boost the segment in the coming years. North America hold a significant share close to 40% in the global nanocellulose market owing to the technological advancements in this region. The region is said to exhibit a highest growth rate in the forecast period owing to the technological pace and industrial development. Europe is said to register a second highest CAGR of over 35% up to 2024. in terms of revenue, the segment was registered a slightly lesser than USD 30 million in 2016 and will grow at an exponential rate in the forecast period. Asia Pacific accounted for close to USD 20 million in 2016 and will grow with a fancy CAGR in the forecast period. 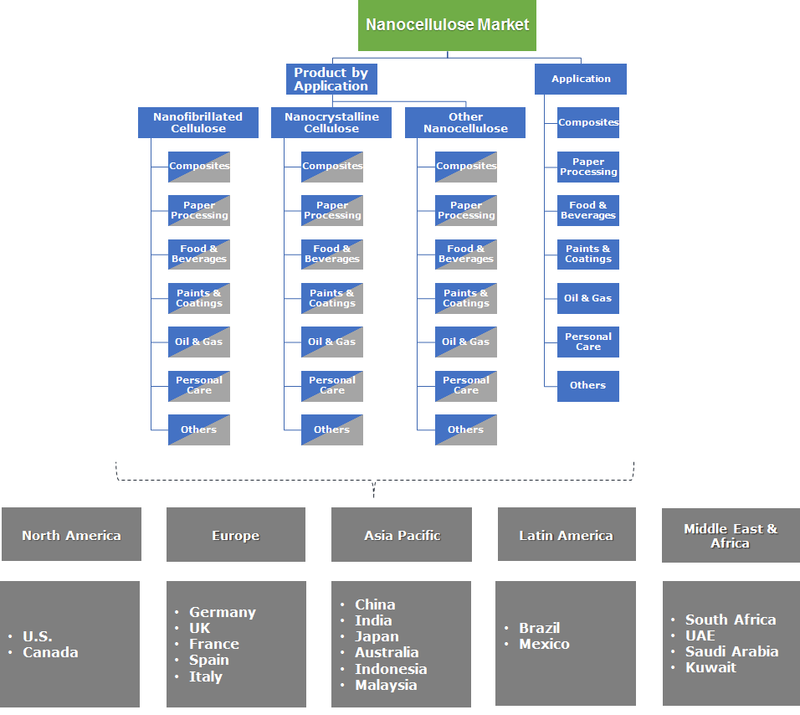 Nanocellulose market consist of some prominent players which include Nippon Paper Group Inc., Melodea Ltd., Kruger Inc., Innventia AB, Daicel FineChem Ltd., Sappi Ltd., CelluForce Inc., Fpinnovations, American Process Inc., J. Rettenmaire & Sohne GmBH (JRS), Borregard ASA, Asahi Kasei Corporation, CelluComp Ltd., Nippon Paper Group, and Stora Enso to name a few. Nanocellulose market, in future is said to grow at an exponentially high CAGR owing to its huge applications in various end-user industries. The product compliments its properties and strength in its applications such as the composites which finds usage in packaging, foams, paints, coatings, and films. With great importance in the medical, pharmaceutical and cosmetic field, these nano-structured celluloses are freeze-dried and used for wound dressings, diapers, tampons, as well as sanitary napkins. Development in the medical and cosmetic field will propel the nanocellulose industry to new heights in future years.